16 U18 teams from across Europe gather in Vichy this weekend to decide the continent’s representative at the Youth Olympics in Montevideo later this year. England - who beat Wales in the 2017 final - will be playing as Great Britain this weekend. The cream of Europe’s rising rugby stars gather in Vichy in central France this weekend to decide who will travel to Montevideo in October for the summer Youth Olympics. This is the second time that rugby sevens has been part of the Youth Olympics, but the first time there has been regional qualifying (in 2014 teams were invited based on the World Cup performances of their adult teams). Japan, Canada, Colombia and New Zealand have already won their regional qualifiers for the six-team event. Europe’s qualifier is this weekend, and Africa will decide the identity of their representative in Algiers in July. To complicate matters winning the tournament does not guarantee a seat on the plane, however, as countries can only enter one team sport at the games, and if a country qualifies in more than one it is ultimately up to their NOC to decide who will travel. For example, Canada won the North American boys’ rugby title, but it is the United States will be representing the region because Canada also qualified for hockey, and the Canadian NOC chose to send their boy’s hockey team instead of rugby. Great Britain will start as favourites, not least because England have won three out of the four previous continental U18 titles. The potential complication of selecting a team from England, Scotland and Wales has been solved by the RFU choosing to simply send the existing England U18 team to the qualifier. Whether the RFU will open up selection to Scottish and Welsh players if Great Britain do go to Montevideo (especially as Wales finished as runners-up in last year’s championship) remains to be seen. With Wales out of the way, France will be strong favourites to reach the final alongside Great Britain. 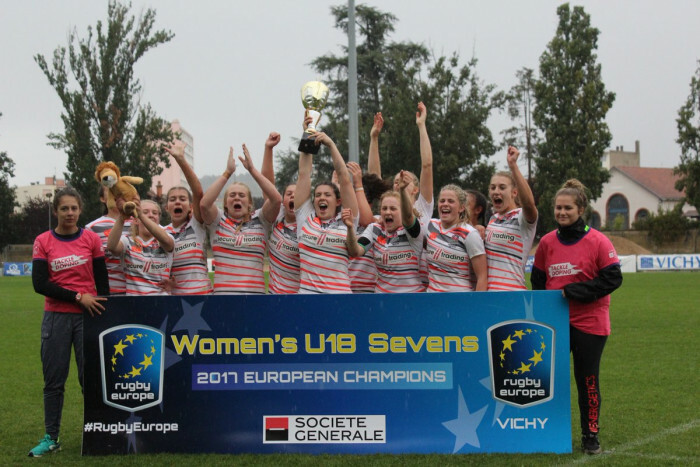 France were late to the U18 sevens party, but won the 2016 tournament at their first attempt, and finishing third last year. However, age group tournament are highly unpredictable with each year producing almost entirely different teams. Success in the tournament is often a measure of the strength of each country’s youth talent identification programme. The full draw and results will appear on the Rugby Europe website and the tournament will be live streamed via RugbyEurope.eu. Great Britain: 1. Shauna Bennett (Gloucester- Hartpury Womens RFC), 2. Lucy Burgess (Winscombe), 3. Jessica Cooksey (Winscombe), 4. Tabitha Copson (Gloucester-Hartpury Womens RFC), 5. Megan Davey (Loughborough Lightning), 6. Lauren Fisher (Pulborough), 7. Emma Hardy (Loughborough Lightning), 8. Amelia Harper (Lougborough Lightning), 9. Jodie Mallard (Wellingborough), 10. Georgia Newman (Cobham), 11. Sophie Peters (Winscombe), 12. Beth Wilcock (Brockenhurst College).